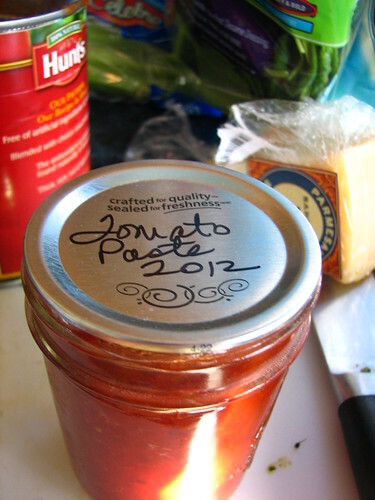 This is a basic bare-bones tomato sauce that can be used for pasta, pizza, or added to soup if you have leftovers. I put this recipe together when my children were much younger. When the house was full of littles, I needed a fast and easy sauce recipe. I’ve used it for years and continue to use it now that the kidlets are grown. I could never see paying a lot for something I could make so cheaply at home! The fastest way to make it is to use dried herbs and spices. It’s just a matter of putting everything into one large pan, then heating to serve. If you add celery, mushrooms, fresh onion or fresh garlic, you can sauté those ingredients in a few tablespoons of olive oil in the sauce pan and add everything else on top when the veggies are sautéed. Put all ingredients into a deep pan, stirring until well blended. Cover with a lid (very important as it will splatter hot sauce all over the kitchen) and heat to a boil. Reduce to a simmer until heated through. Serve over pasta or use as a pizza sauce. Leftovers can also be added to soup. This past summer, I canned a few eight-ounce jars of tomato paste, so I add one of those if we’re having company. 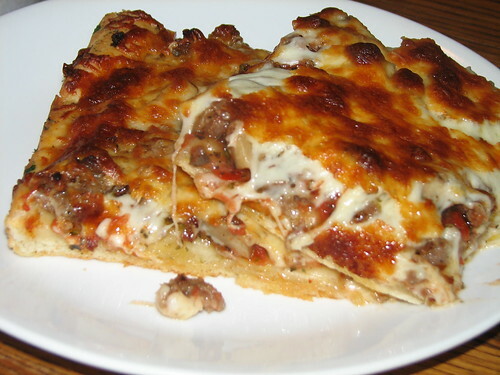 Try the sauce on pizza using my pizza dough recipe at this link. This sauce is so easy to make. If you are a beginner cook, this is the recipe for you. As you gain confidence cooking, you can begin to add or subtract ingredients. Add cooked ground beef or cooked crumbled sausage to the sauce. Use fresh veggies instead of dried. Add more Parmesan. Or fresh rosemary, finely chopped. The recipe is quite flexible. Make it your own. This entry was written by ~~Rhonda, posted on February 21, 2013 at 1:31 pm, filed under Recipes. Bookmark the permalink. Follow any comments here with the RSS feed for this post. Post a comment or leave a trackback: Trackback URL. 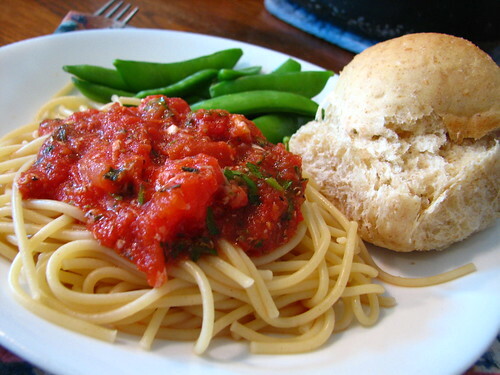 Your spag sauce is amazingly similar to mine, though I don’t add cheese into the sauce, or any sugar. It’s so much better than store bought, isn’t it?! I’m going to try adding some celery seed next time. 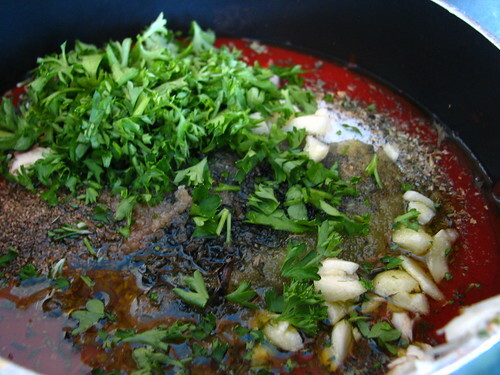 For pizza sauce, try adding a little bit of ground anise (we like to crush anise seeds in a mortar and pestle). Secret ingredient!